Background/Context. Transfer is a core function of community colleges; this is a critical point given that these institutions serve as the primary pathway into postsecondary educa- tion for Black men. However, too few Black men identify transfer as a primary goal and/or eventually transfer to a 4-year college or university. 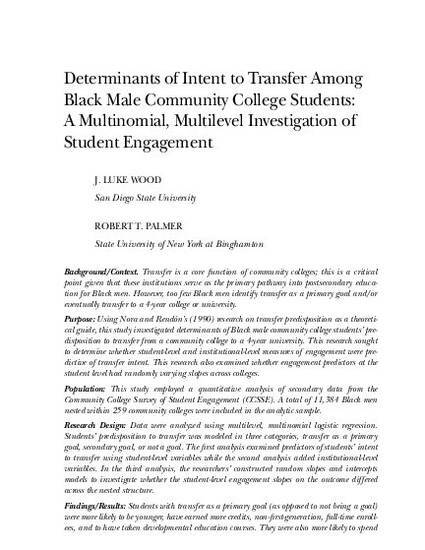 Purpose: Using Nora and Rendón’s (1990) research on transfer predisposition as a theoreti- cal guide, this study investigated determinants of Black male community college students’ pre- disposition to transfer from a community college to a 4-year university. This research sought to determine whether student-level and institutional-level measures of engagement were pre- dictive of transfer intent. This research also examined whether engagement predictors at the student level had randomly varying slopes across colleges. Population: This study employed a quantitative analysis of secondary data from the Community College Survey of Student Engagement (CCSSE). A total of 11,384 Black men nested within 259 community colleges were included in the analytic sample. Research Design: Data were analyzed using multilevel, multinomial logistic regression. Students’ predisposition to transfer was modeled in three categories, transfer as a primary goal, secondary goal, or not a goal. The first analysis examined predictors of students’ intent to transfer using student-level variables while the second analysis added institutional-level variables. In the third analysis, the researchers’ constructed random slopes and intercepts models to investigate whether the student-level engagement slopes on the outcome differed across the nested structure. Findings/Results: Students with transfer as a primary goal (as opposed to not being a goal) were more likely to be younger, have earned more credits, non-first-generation, full-time enroll- ees, and to have taken developmental education courses. They were also more likely to spend more hours per week studying and involved in extracurricular activities. These students were also more engaged in active and collaborative learning and used student services on campus. Conclusions/Recommendations: This research has shown that that the factors influencing Black men’s predisposition toward transfer largely mirror that of their White and Hispanic peers. Findings from this study demonstrated that social integration was a positive predictor of students’ intent to transfer; the finding diverges from prior research on Black men in the community college, which have shown social integration to serve as a negative predictor of success outcomes.